Draft: 2004, Milwaukee Brewers, 2nd rd. Is married.....wife's name is Patricia... He and his wife have a son, Yovani Jr., and two daughters, Zayra and Zoey... Graduated from Trimble Tech (TX) High School... Committed to Texas Christian University prior to signing with Milwaukee in 2004... Has helped purchase uniforms for the Felix Mantilla Little League during his Brewers career... Provided financial support in 2013 to Stillwaters Cancer Support Services in Waukesha, WI... Donated his time to the Muscular Dystrophy Association's 2013 "Team Muscle" event... Joined Brewers Community Foundation in 2011 to purchase new scoreboards for Baran Park in Milwaukee.....the two scoreboards were installed in May 2011...Favorite sport other than baseball is soccer... Last name is pronounced "guy-YAR-doe"
Totals - Went 6-8 with 5.42 ERA (71 ER, 118.0 IP) with 85 strikeouts in 23 starts with Baltimore...Trouble in the First - Posted 8.61 ERA (22 ER, 23.0 IP) in first inning of his 23 starts, surrendering 29 hits (including seven home runs) and 18 walks in the first frame...Moving Up - 105th win on June 29 at San Diego, passing Ismael Valdez for 3rd-most by Mexican-born pitcher in MLB history (enters 2017 with 108)…trails Fernando Valenzuela (173) and Esteban Loaiza (126)... Milestone Start - 250th career start on June 24 vs. Tampa Bay, becoming 4th Mexican born pitcher to make 250+ career starts (also: F. Valenzuela, 424; E. Loaiza, 333 & I. Valdez, 288)…one of 23 active pitchers to make 250 or more starts... DL Stint - Placed on the 15-day disabled list with right shoulder bicep tendinitis on April 23, his first DL stint since 2013…activated from the DL on June 18 after rehab assignments with advanced-A Frederick and AAA Norfolk. Had the lowest ERA among Milwaukee qualifiers at 3.51, the best of his career and 20th lowest in the N.L....tied for 1st on the staff in starts (32, T12th in N.L. ), was 2nd in strikeouts (146), and placed 3rd in wins (8-tied), and innings (192.1)...had a string of 6 consecutive winning seasons (excluding 2008) come to an end...had the 5th-lowest run support average in the N.L. (3.28), and ranked 5th in the league in road ERA (2.70)...opposition batted .261, .235 by LHB and .279 by RHB...was the victim of 6 blown saves, 2nd most on the club (Kyle Lohse-7)...was 3rd on the club in quality starts (20), going 8-1, 1.55 (23 ER/133.1 IP) in those games. Went 12-10 with a 4.18 ERA in 31 starts...Produced 17 quality starts.....the team went 16-15 in his starts...Led the team in wins (12) for the fourth consecutive season and strikeouts (144) for the fifth straight season...Was on the 15-day disabled list from 7/31-8/16 with a strained left hamstring...Was 8-9 with a 4.91 ERA in 23 starts prior to going on the DL (128.1ip, 70er) and 4-1 with a 2.41 ERA in 8 starts after being reinstated (52.1ip, 14er)...Started on Opening Day for the fourth consecutive season, joining Ben Sheets (2002-05) as the only Brewers pitchers to start four straight openers.....Gallardo received a no-decision in the Brewers' 5-4, 10-inning win vs. Colorado (5ip, 10h, 3r, 3er, 1bb, 3k, 2hr)...Notched his 1,000th career strikeout on 6/10 at Miami (Marcell Ozuna)...Extended his franchise-leading home run total to 12 with homers on 4/18 vs. San Francisco (off Matt Cain) and 4/29 vs. Pittsburgh (off Wandy Rodriguez)...Participated in the World Baseball Classic for Team Mexico.....earned a 5-2 win in his only start in the WBC on 3/8 vs. Team USA (3.1ip, 2h, 1r, 1er, 1bb, 4k). Was named Brewers Most Valuable Pitcher for the third time in four seasons as voted on by members of the Milwaukee Chapter of the Baseball Writers Association of America. Went 16-9 with a 3.66 ERA in 33 starts ... the Brewers went 22-11 in his starts. Ranked among the National League leaders in both walks (4th, 81) and strikeouts (6th, 204) as well as quality starts (T2nd, 25) and wins (T6th, 16). Produced his fourth consecutive 200+ strikeout season (204, 200, 207 and 204) ... became the ﬁrst Brewer ever with four seasons of 200+ strikeouts. Started on Opening Day for the third consecutive season on 4/6 vs. St. Louis and took an 11-5 loss (3.2ip, 7h, 6r, 6er, 5bb, 3k, 4hr) ... joined Teddy Higuera (3) and Ben Sheets (4) as the only Brewers pitchers to start three straight openers. Struck out 10 batters over 6.0 innings on 6/5 vs. Chicago-NL but suffered a 10-0 loss. Notched a career-high 14 strikeouts over 7.0 innings in a 4-1 win on 7/15 vs. Pittsburgh. From 7/31-9/18 had a career-high 8-game winning streak over 11 starts during which he posted a 2.75 ERA (72ip, 22er). On 9/2 vs. Pittsburgh belted his 10th career home run, extending his franchise record, with a solo shot off Chris Leroux. Was selected to the Team Mexico provisional roster for the 2013 World Baseball Classic. Enjoyed his best season in the Major Leagues as he went 17-10 with a 3.52 ERA in 33 starts. ... Was seventh in National League Cy Young Award voting (one fourth and three fifth-place votes). ... Established career bests in wins (17), ERA (3.52), starts (33), quality starts (23), innings pitched (207.1) and strikeouts (207). ... Ranked among the National League leaders in wins (T4th, 17), starts (T4th, 33) and strikeouts (5th, 207). ... Became the first pitcher in franchise history to produce three consecutive 200+ strikeout seasons (204, 200, 207) ... joined Zack Greinke (201) as the first pair of Brewers teammates to record at least 200 strikeouts in the same season. ... Made 5 starts with 10 or more strikeouts (10, 10, 12, 13, 11). ... The Brewers went 20-13 in his starts. ... Made his second consecutive Opening Day start on 3/31 at Cincinnati and received no decision in the Brewers' 7-6 loss (6ip, 7h, 2r, 2er, 3bb, 4k, 1hr). ... Threw his fourth career complete game and third shutout in a 1-0 victory on 4/5 vs. Atlanta (9ip, 2h, 2bb, 2k) ... it marked the Brewers' only complete game of the season and came in Ron Roenicke's first win as a Major League manager. ... Belted his ninth career home run on 4/22 vs. Houston with a solo shot off Nelson Figueroa to extend his franchise record ... was his only home run of 2011. ... Was named Brewers Pitcher of the Month for May, going 5-1 with a 2.25 ERA in 6 starts (40ip, 10er). ... Took a no-hitter into the eighth inning of his 4-0 win on 5/7 at St. Louis (8ip, 1h, 4bb, 6k) ... the lone hit was a leadoff single to Daniel Descalso. ... Tied his career high with a 6-game winning streak over 6 starts from 5/7-6/4, posting a 1.32 ERA (41ip, 6er). ... Finished the season with three straight double-digit strikeout games (12, 13, 11), including a career-high 13 over 6.0 innings on 9/17 at Cincinnati in a 10-1 win. ... Became the first pitcher in franchise history to register three straight double-digit strikeout games when he finished the season with 11 strikeouts over 7.1 innings on 9/23 vs. Florida ... he received no decision in the 4-1 win as the Brewers clinched the National League Central. ... Made 3 starts during the postseason, going 1-1 with a 2.84 ERA (19ip, 6er). ... Started 2 games in the NLDS vs. Arizona, going 1-0 with a 1.29 ERA (14ip, 2er). ... Earned his first career postseason victory in Game 1 of the NLDS on 10/1 at Miller Park in a 4-1 win (8ip, 4h, 1r, 1er, 1bb, 9k, 1hr). ... Also started Game 5 of the NLDS on 10/7 at Miller Park and received no decision in the Brewers' 3-2, 10-inning clinching victory (6ip, 6h, 1r, 1er, 2bb, 5k, 1hr, 1wp). ... His only start of the NLCS vs. St. Louis came in Game 3 on 10/12 at Busch Stadium as he took a 4-3 loss (5ip, 8h, 4r, 4er, 5bb-2ibb, 2k, 3wp) ... allowed all 4 runs in the first inning. For the second straight season was named Brewers Most Valuable Pitcher as voted on bymembers of the Milwaukee Chapter of the Baseball Writers Association of America ... Signed a 5-year contract on 4/8 which runs through the 2014 season with a club option for 2015 ... Went 14-7 with a 3.84 ERA in 31 starts ... Led the team with a career-high 14 wins ... The Brewers went 17-14 in his starts ... Made a career-high 17 quality starts for the second straight season ... Was named to his first All-Star team (did not pitch due to injury) ... Ranked ninth in the National League in strikeouts (200) ... Had his second straight 200+ strikeout season (204/200) ... joined Teddy Higuera (1986-87)as the only pitchers in franchise history to produce consecutive 200+ strikeout seasons ... Produced 7 starts with 10 or more strikeouts, including a career-high 12 twice ... Was named Brewers Pitcher of the Month for both May (3-0, 2.31) and June (3-1, 2.20) ... Won his first career Silver Slugger Award ... Led Major League pitchers with 4 HR and 10 RBI as he batted .254 (16-for-63) ... he now has8 HR in his career, the most in franchise history ... Made the first Opening Day start of his career on 4/5 vs. Colorado and suffered a 5-3 defeat(7ip, 7h, 4r, 3er, 2bb, 5k, 1hr, 1wp) ... On 5/1 at San Diego became the eighth pitcher since 1960 to produce a home run and 10+strikeouts in the same game twice, joining Steve Carlton (5x), Don Drysdale (4x), Bob Gibson(3x), Earl Wilson (3x), Ferguson Jenkins, Tom Seaver and Kerry Wood ... Gallardo homeredoff Mat Latos (solo) and notched 11 strikeouts in the 2-1 win ... he also pulled off the feat in a1-0 win on 4/29/09 vs. Pittsburgh (homer off Ian Snell with 11 strikeouts) ... Had a pair of complete games, both shutouts ... Tossed his first career shutout in a 2-0 win on 5/28 vs. New York-NL (9ip, 8h, 1bb, 7k) ... thegame was won on a Corey Hart 2-run walkoff homer ... His second shutout came in a 5-0 win on 6/24 vs. Minnesota (9ip, 5h, 0bb, 12k) ... the 12strikeouts in that start tied his career high ... Also recorded 12 strikeouts in an 18-1 win on 8/2 at Chicago-NL (6ip, 2h, 1r, 1er, 1bb, 12k) ... Was on the 15-day disabled list from 7/6-7/21 with a left oblique strain (retroactive to 7/5) ... hesuffered the injury on 7/4 at St. Louis in his shortest start of the season (2.2 innings) ... Was 8-4 with a 2.58 ERA prior to going on the DL (111.2ip, 32er) and 6-3 with a 5.77 ERA aftercoming off (73.1ip, 47er) ... Had a career-high 6-game winning streak over 9 starts from 4/21-6/2, posting a 1.74 ERAduring this stretch (57ip, 11er). Was named Brewers Most Valuable Pitcher as voted on by members of the Milwaukee Chapter of the Baseball Writers Association of America...Went 13-12 with a 3.73 ERA in 30 starts...The Brewers went 16-14 in his starts...Produced a team-leading 17 quality starts...Held opponents to a .219 batting average, which ranked third in the National League...Ranked among the National League leaders in both walks (2nd, 94) and strikeouts (5th, 204)...Had the fifth 200+ strikeout season in franchise history, joining Ben Sheets (2004), Teddy Higuera (1986-87) andDoug Davis (2005)...Gallardo's 204 strikeouts rank fifth on the all-time franchise single season list...Made 4 starts in which the Brewers did not score a run...Belted a pair of home runs in 2009, giving him 4 homers for his career, the most in franchise history by a pitcher...Was named Brewers Pitcher of the Month for April, going 3-1 with a 2.86 ERA in 5 starts (34.2 IP, 11 ER)...On 4/8 at San Francisco belted a 3-run home run off Randy Johnson in a 4-2 win...became the first pitcher ever to hit a home run off Johnson...Tossed the Brewers' only complete game of the year in a 5-2 win on 4/24 at Houston (9 IP, 5 H, 2 R, 2 Er, 0 BB, 7 K, 1 HR)...On 4/29 vs. Pittsburgh (8 IP, 2 H, 0 R, 0 ER, 1 BB, 11 K) he became just the third pitcher in Major League history to win a 1-0 game while recording at least 10 strikeouts and hitting a home run (off Ian Snell)...the others to do it were Hall of Famers Red Ruffing (1932 with NYY) and Early Wynn (1959 with CWS). Went 0-0 with a 1.88 ERA in 4 starts...The Brewers went 2-2 in his starts...the team went toextra innings in 3 of his 4 starts...Missed most of the season with separate knee injuries...Began the season on the 15-day disabled list with a tornlateral meniscus in his left knee...was recovering from 2/19 surgery (Dr. William Raasch)...Made 3 rehab starts at Triple-A Nashville before he was reinstated on 4/20...Made his season debut on 4/20 at Cincinnati andreceived no decision in the Brewers' 4-3, 10-inning loss (7 IP, 4 H, 1 R, 1 ER, 3 BB, 4 K, 1 HR)...Tossed 7.0 shutout innings on 4/25 vs. Florida but received no decision as the Brewers lost, 3-0, in 10 innings (7 IP, 6 H, 0 R, 0 ER, 2 BB, 5 K)...Suffered a torn ACL in his right knee on a play at first base on 5/1 at Chicago-NL...was placed on the 15-day disabled list the next day and underwent surgery on 5/13 (Dr. Raasch)...Was reinstated from the disabled list on 9/23 and made his final start of the season on 9/25 vs. Pittsburgh...he received no decision in the Brewers' 5-1, 10-inning win (4 IP, 3 H, 1 R, 1 ER, 2 BB, 7 K, 1 HR)...Appeared in 2 games in the NLDS vs. Philadelphia...he started Game 1 on 10/1 at Citizens Bank Park (lost) and made a relief appearance in Game 4 on 10/5 at MillerPark...did not allow an earned run (7 IP, 3 R). October 29, 2018 RHP Yovani Gallardo elected free agency. June 17, 2018 Texas Rangers selected the contract of RHP Yovani Gallardo from Round Rock Express. April 20, 2018 RHP Yovani Gallardo assigned to Round Rock Express. 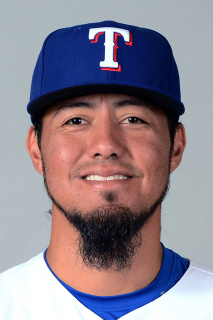 April 13, 2018 Texas Rangers signed free agent RHP Yovani Gallardo to a minor league contract. April 12, 2018 RHP Yovani Gallardo elected free agency. April 12, 2018 Cincinnati Reds sent RHP Yovani Gallardo outright to Louisville Bats. April 10, 2018 Cincinnati Reds designated RHP Yovani Gallardo for assignment. March 31, 2018 Cincinnati Reds signed free agent RHP Yovani Gallardo. March 26, 2018 Milwaukee Brewers released RHP Yovani Gallardo. December 21, 2017 Milwaukee Brewers signed free agent RHP Yovani Gallardo. November 2, 2017 RHP Yovani Gallardo elected free agency. October 5, 2016 Baltimore Orioles activated RHP Yovani Gallardo. October 4, 2016 Baltimore Orioles reassigned RHP Yovani Gallardo to the minor leagues. June 18, 2016 Baltimore Orioles activated RHP Yovani Gallardo from the 15-day disabled list. June 7, 2016 Baltimore Orioles sent RHP Yovani Gallardo on a rehab assignment to Norfolk Tides. June 2, 2016 Baltimore Orioles sent RHP Yovani Gallardo on a rehab assignment to Frederick Keys. April 23, 2016 Baltimore Orioles placed RHP Yovani Gallardo on the 15-day disabled list. Right shoulder bicep tendinitis. February 25, 2016 Baltimore Orioles signed free agent RHP Yovani Gallardo. November 2, 2015 RHP Yovani Gallardo elected free agency. August 17, 2013 Milwaukee Brewers activated RHP Yovani Gallardo from the 15-day disabled list. July 31, 2013 Milwaukee Brewers placed RHP Yovani Gallardo on the 15-day disabled list. Tight left hamstring. July 22, 2010 Milwaukee Brewers activated RHP Yovani Gallardo from the 15-day disabled list. July 6, 2010 Milwaukee Brewers placed RHP Yovani Gallardo on the 15-day disabled list retroactive to July 5, 2010. Right oblique strain.